John Tesarsch’s The Last Will and Testament of Henry Hoffmann (Affirm Press, 2014) is a masterpiece. I’ve reviewed a lot of books in the past twenty plus years, (in local magazines and 85 for The Canberra Times, and more recently in this blog) but I have never described a novel like that. This one deserves it. I simply could not put it down and I am in awe of the author’s mastery of the form. The novel deals with the theme of death as a catalyst for examining life – the past life, in this case with its extraordinary secrets, and life in the present for the survivors, who include the three children of Henry Hoffmann. When Henry unexpectedly dies they must deal with his idiosyncratic will. The eldest of Henry’s progeny, Eleanor, very bright like her father, is teaching at a boys’ school and trying to find the time to do her PhD. Sarah used to be a concert pianist and now simply immerses herself in her music, after suffering debilitating stage fright. Robbie is the black sheep whose real estate deals and secrecy have led him into financial woes and made his wife Carla very unhappy. Tesarsch’s first novel The Philanthropist (Sleepers, 2010), also a story of family secrets, was very readable and competent but this second one is lifted to another level. With its engaging and increasingly compelling plot The Last Will and Testament of Henry Hoffmann moves through the settings of Melbourne and to its north during the 2009 Black Saturday bushfires, to Vienna during World War II and to contemporary San Francisco. The plot moves at a fast pace while simultaneously we gain a deeper knowledge of the characters. Their professions and preoccupations emerge organically and authentically; they are not ‘pasted on’ as they are in many novels. I neglected things I should have been doing to read what would happen next to these people I had come to care about. They will stay with me for a long time. You can pick up the book at almost any page and original descriptions of major and minor characters will stand out. The worlds of music, the law and finance are vividly evoked. I read on public transport and I didn’t see the Canberra streets my bus took me along or the Blue Mountains landscapes through the train window when I was visiting there because I was transported to Austria by this novel and I was with a pair of adolescents fleeing for their lives towards the end of the Second World War. Chekhov said once that ‘real drama is soul drama’. This novel is a brilliant example of the truth of Chekhov’s belief. We see the characters growing and changing under the pressure of experience. And we come to care deeply about them. 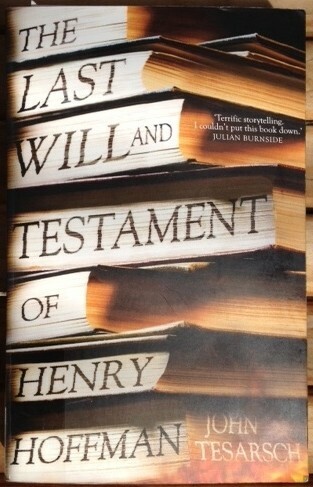 The Last Will and Testament of Henry Hoffmann is authentic, sophisticated and uplifting. It was a rare pleasure to read this intelligent, humane voice. We need more novels like this. John Tesarsch looks pretty young in the author photo – good news indeed! I can’t wait for his next novel. Thanks for this great review, Pen. I haven’t read him but I’m now about to look him up and order this book from the library – so many books; so little time!